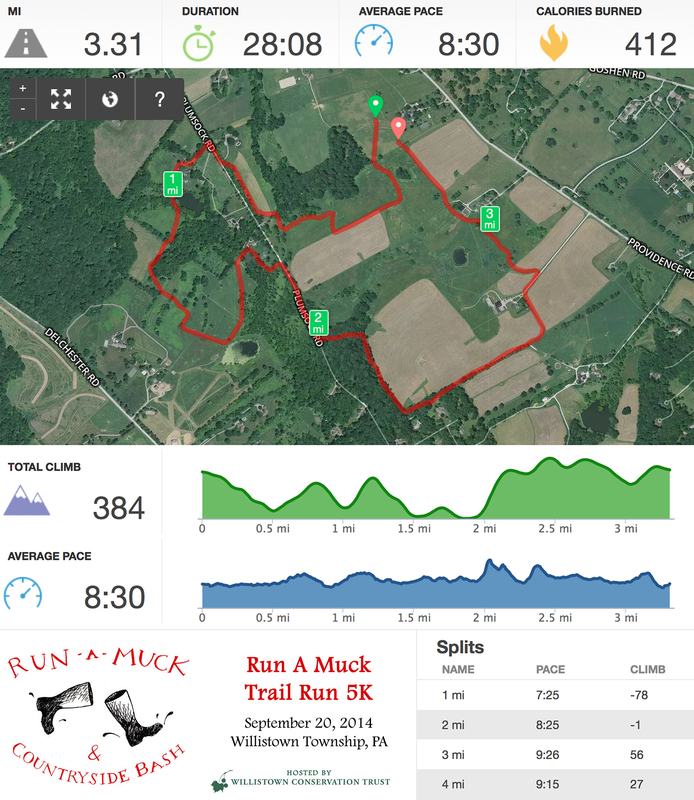 Yesterday afternoon at 4PM Willistown Conservation Trust‘s annual Run A Muck cross country race began. 28 minutes later, I beat Matt and my brother and finally got the chance to see how far my running has progressed over the past year. Last year’s Run A Muck was my first race ever. The course was long (3.6 miles), extremely hilly, and just plain HARD. 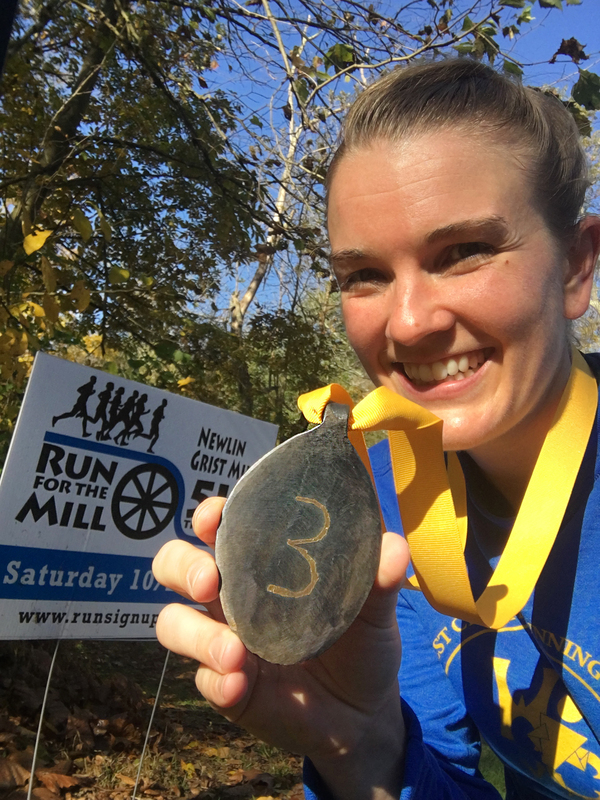 Last year I took lots of walking breaks, poured water over my head at every water station, and dragged myself across the finish in 35:16 — around a 9:47/mile pace. This year’s course was still ridiculously hard, with a 100 foot climb in just 2/10s of a mile, gratuitous uphill and downhill repeats, and a wooded section that was basically a staircase (going up, of course). But that’s where the similarities end. This year I was much better prepared and I’m excited to report that I finished the 3.3 mile course in 28:08! That’s an average pace of 8:30… more than 1:15 per mile faster than last year! In addition to finishing with a much better time, I also ran the whole freakin’ course. The WHOLE thing!! This may not seem that impressive – it’s just a 5K, after all – but let me tell you… the last 1.5 miles of this course were brutal. Towards the end it seemed like EVERYONE was walking. I thought about walking for a moment (you know, the old “I could probably walk up this hill just as fast as I’m running it” argument) but I kept moving (albeit slowly) and ended up passing a bunch of people in the last mile. Speaking of passing people… I beat Matt AND my brother in yesterday’s race!! I pulled even with Matt around the 1 mile marker and was planning on running with him when a woman passed us and I decided to try to run with her instead. Unfortunately I wasn’t able to keep up with her for long (she was the eventual female winner), but that little spurt of speed took me past Matt for the rest of the race. I caught up to my brother Billy with around a mile to go. He was walking up a wickedly steep hill (along with everyone else around him) and at first I didn’t realize it was him. In past races Billy has been much faster than me – back at Victory in May he beat me by more than 2 minutes – but I guess my long runs and track workouts are paying off. I trudged past him at a slow jog as we crested the hill and just kept on going. One of the many hills! That’s the event side way over there on the left… so many hills! The last few minutes of this race felt like they lasted forever. I was exhausted. Mentally I’d gotten a little boost when I passed Billy, but then two women passed me near the end looking super strong. I had been sitting in 2nd up to that point and picked up my pace in an effort to keep up with them, but I lagged behind as they powered up the final hill and cruised down to the finish a few seconds ahead of me. My 28:08 finish was good enough for 17th overall and 4th place woman. Billy crossed the line in 28:24 (19th) with Matt close behind at 28:51 (21st). The full results are here. Matt and I cooled down with a nice hike along the Run A Muck walking course. All of the land that Run A Muck traversed is privately owned and open just for this event, so it was nice to get a chance to walk around and take some photos of the beautiful (aka EVIL!!) rolling hills and farmland that we’d just run through. We made it!! 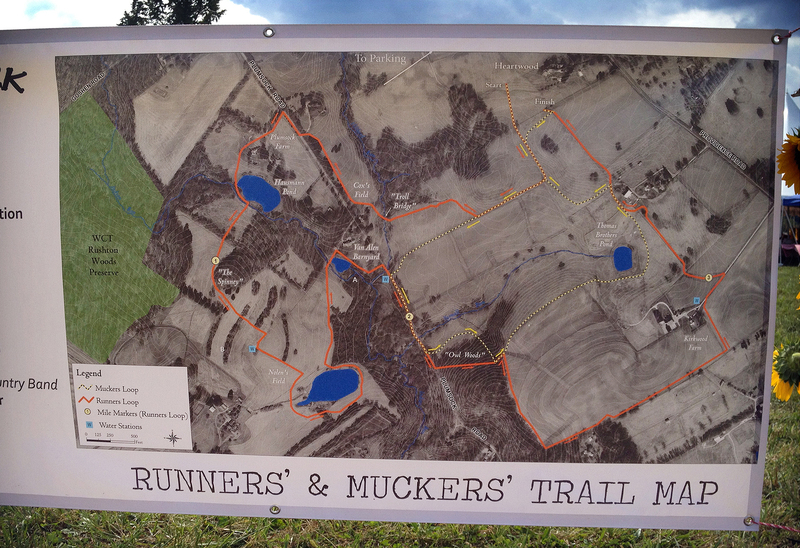 Matt and I successfully completed the Willistown Conservation Trust “Run-A-Muck” 5K race yesterday afternoon. 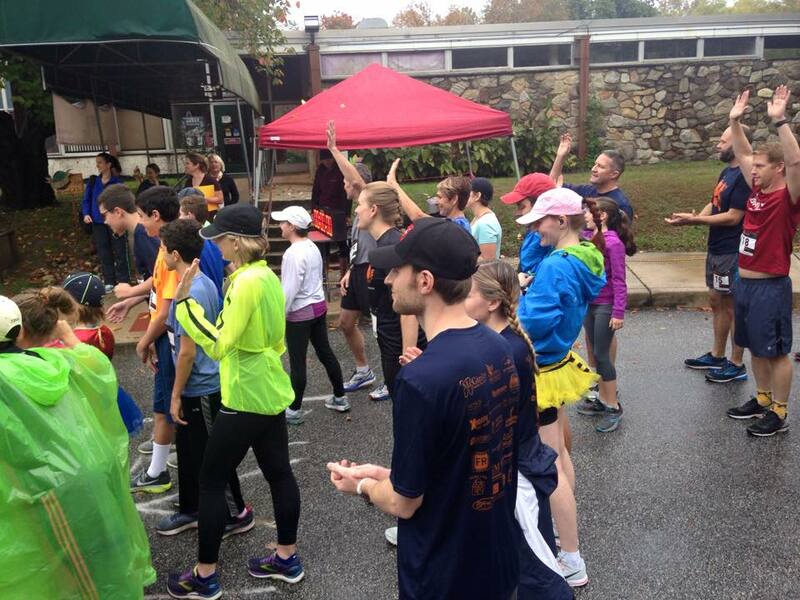 The race ended up being longer than a 5k and it was SUPER hilly, but we finished! My original goal was to beat 32 minutes (i.e. run 10 minute miles) so when I came over the last hill and saw the finish line clock at 35 minutes I was a little disappointed. That is, until Matt told me that his and other runners’ GPS running apps were saying that the race was more like 3.65 miles long. That means I DID meet my pace goal, woohoo! The course was tough… it took us through beautiful horse fields, around several ponds, up what seemed like a near-vertical climb in the woods (I walked it), and along a dirt road. I started out WAY too fast (7:30-8:00 mile, eek!) and then I paid for it on every single steep uphill climb after that, but it was a good learning experience and I think this will just make future races that much easier.